This man actually needs no introduction and his 1999 hit song Yaanom equally needs no introduction. Obrafuor created a unique image for himself and raised the bar for Hiplife. He made Yaanom a timeless creative art. This is why Obrafuor is still regarded as a legend. Lord Kenya may be an evangelist now but his footprint in the sand of Hiplife is still indelible. In Enyom no, he spat fire, though not a necessarily a diss song he attacked his own beat and made the song a masterpiece. Honestly this rapper is relatively unknown. His name is never mentioned on radio and mainstream media- a very strange fact. But his song, which isused as a soundtrack (the only recognition he gets) for the popular series, Afia Swarzeggnegger is a true reflection of his quality which is still unrecognised. The Tema boys did a very good job on this song. I particularly like the lyrics and the manner at which Omar Sterling ‘destroyed’ the track. This list will definitely not be incomplete without any of Sarkodie’s song. In this song which is a cover version of Rick Ross’ Hustling, Sarkodie demonstrated something rare. 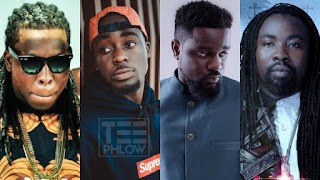 Edem’s U dey craze song was a massive hit because of its mixture of great punchlines spewed by Sarkodie and Kwaw Kesse. Though lots of us can’t understand Ewe, Edem’s language, U dey was crazy with much venom from Edem and his companions.